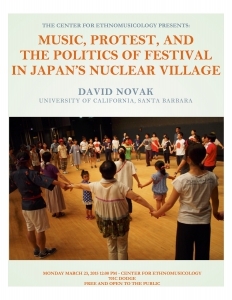 "Music, protest,and the politics of festival in Japan's nuclear village"
David Novak is Associate Professor of Music and Co-Director of the Center for the Interdisciplinary Study of Music at the University of California, Santa Barbara. He is the author of Japanoise: Music at the Edge of Ciruclation (Duke Univ. Press, 2013). He holds the PhD in Ethnomusicology from Columbia University. His work explores cultural and political formations through the ethnography of popular music, and examines how the circulation of global media becomes central to processes of social and epistemological transformation. His interests include globalization of popular music, remediation, protest culture, and social practices of listening. His current project focuses on the politics of sound in urban Japan, particularly in the impact of noise regulations on homeless and migrant labor communities in South Osaka, and on the role of music, sound, and noise in the antinuclear movement in post-3.11 Japan.